Anja Rubik wears dress by YSL photographed by Mario Sorrenti for PORTER. For its Summer Escape issue, PORTER is proud to partner with Parley for the Oceans – a global collaboration network pioneering a new approach to environmentalism – as well as acclaimed photographer Mario Sorrenti and cover star Anja Rubik to highlight the plastic crisis facing our blue planet. For a second year, the title dedicates an entire issue to championing Content + Commerce + Cause this time exploring the beauty and fragility of the oceans. 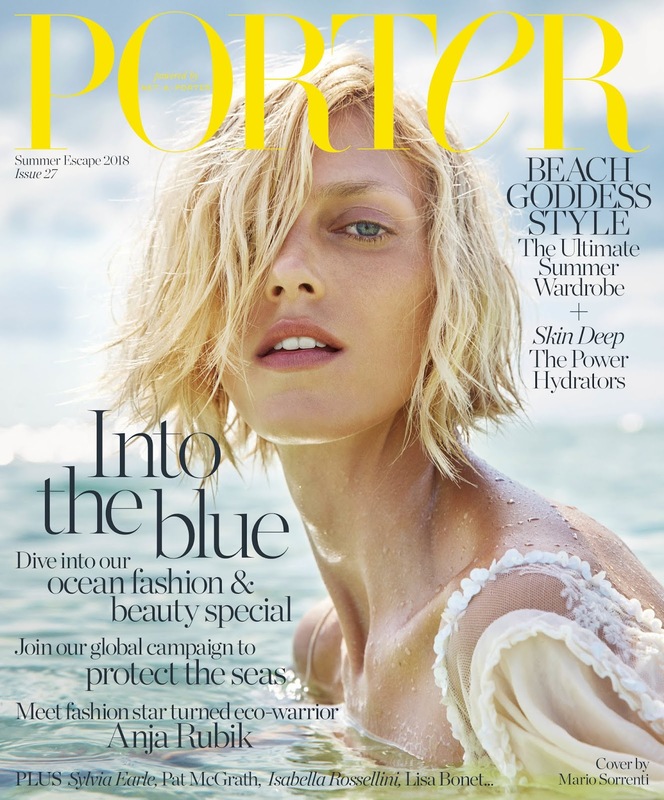 In a breath-taking 63-page portfolio shot by Sorrenti on Parley's island in the Maldives, extraordinary fashion imagery is juxtaposed with Sorrenti's powerful documentary photography illustrating the stark reality and impact of plastic pollution upon our seas. ⏩ The accompanying essays take a deep dive into the urgent environmental catastrophe facing our planet, including a moving Q&A with world-renowned oceanographer Sylvia Earle; and highlight ways we can all affect change. "Did you know every second breath we take comes from the oceans?" says supermodel and Parley ambassador Rubik, in addition to guest editing the issue. PORTER will continue to support this partnership with a two-month campaign across both Porter.com and all social channels – asking readers to get involved by taking a pledge to reduce their personal plastic use by making a plastic sacrifice and sharing the hashtag #plasticnotfantastic. "The fashion community can drive the movement – we can create trends," says Rubik. PORTER's editor-in-chief Lucy Yeomans says: "We are so proud to partner with Parley for the Oceans and use our editorial platform to highlight this cause and be able to engage the powerful medium of fashion to protect our oceans."